Preparations are underway for April’s strategic retreat, and we need your input to help us develop the CAP’s key goals and objectives for the next five years. Our planning will include a SWOT analysis and I encourage all of our members to send me an email (president@cap.ca) with their thoughts on the CAP’s perceived strengths, weaknesses, opportunities and threats. If you have any other ideas or suggestions about how we can grow our membership and make strategic improvements, please reach out to me or any of our other Board members ahead of the next Board meeting on April 20-22. Get involved with one of our Divisions, perhaps even as a member of their executive. The CAP’s organizational structure places a lot of responsibilities on our Divisions which support and promote specialized areas of interest in physics. Well-managed and active Divisions are key to the success of the organization. I encourage you to visit our Division pages to see how you can get involved. Lastly, the proposed 2018 Federal Budget was tabled February 28. Thank you to the CAP’s Science Policy Committee for preparing an analysis of science-related highlights, including how the Government responded to the recommendations in the Fundamental Science Review/the Naylor Report. This budget summary can be found on the CAP’s website. 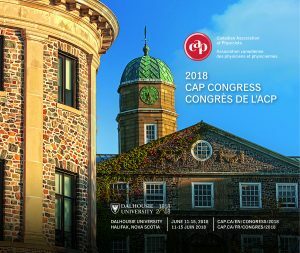 Thank you to everyone who submitted abstracts for the upcoming 2018 CAP Congress at Dalhousie University in Halifax. Post-deadline abstracts are still being accepted for poster presentations while space permits. Please visit the abstract system on the CAP website for more details. Our Herzberg Public Lecture will be given by Dr. Nergis Mavalvala from LIGO/Massachusetts Institute of Technology. Please check the 2018 CAP Congress page as we continue to update the list and details about our plenary and invited speakers. This year’s Congress is also offering additional professional development opportunities for graduate students looking to stand out as they enter the job market. Activities include a pre-Congress Physics in the Workforce workshop on June 10th, auxiliary lunchtime learning sessions throughout the week, and industry panel discussions. Registration for the workshop and auxiliary opportunities will be available as part of the CAP Congress registration starting the week of 2018 April 1st. Details about how to register will be posted on the 2018 CAP Congress website in the coming weeks. We look forward to seeing you in Halifax June 10-15. After receiving two very strong applications, the CAP is pleased to announce the University of Ottawa has been named the host institution for the 2019 Canadian Conference for Undergraduate Women in Physics (CCUWiP). 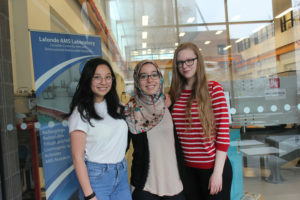 Congratulations to University of Ottawa students (left to right) Emily Zhang, Amina Berrada and Courtney Towers who submitted the successful bid to host the January 18-20, 2019 conference. 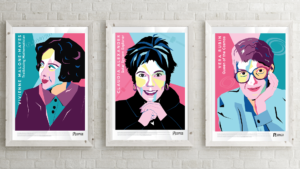 We look forward to the fantastic work you will do as 2019 CCUWiP co-chairs. The CAP sends its sincerest thanks to the York University team whose excellent bid made this a very difficult decision. We look forward to the opportunity to work with you at future conferences. 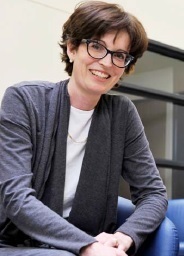 Dr. Sophie LaRochelle has been appointed to the NSERC Council for a term from February 6, 2018 to February 5, 2021. 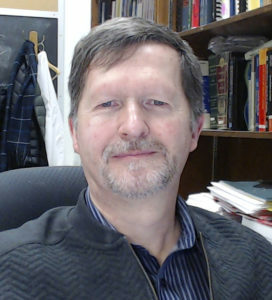 Dr. LaRochelle is a Professor at Université Laval and Tier 1 Canada Research Chair in Advanced Photonics Technologies for Communications (APTECS). She holds an M.Sc in Physics from Université Laval and a Ph.D. in Optics from the University of Arizona. Dr. LaRochelle has been honoured with a number of awards including the Science and technology award, YWCA, Québec in recognition of excellence in a non-traditional career for women. She was also the recipient of the CAP-Newport award in 1991 from the Canadian Association of Physicists. Dr. Helge Seetzen has been appointed to the NSERC Council for a term from February 6, 2018 to February 5, 2020. Dr. Seetzen is the Chief Executive Officer and founder of Tandem Launch. He is also a co-founder of the Sunnybrook Technologies and later BrightSide Technologies which commercializesdisplay technologies developed at the University of British Columbia. Dr. Seetzen received a B.Sc. degree in physics and a Ph.D. degree in interdisciplinary imaging technology (physics & computer science) from the University of British Columbia. On behalf of the Canadian physics community, the CAP-NSERC Liaison Committee congratulates Dr. LaRochelle and Dr. Seetzen for their prestigious appointments. We look forward to their support for physics research and innovation in Canada. The Division of History of Physics (DHP) was established in 2005. Its purpose is to highlight the history of the development of physics research in Canada and elsewhere, and to encourage CAP members in their efforts to collect, preserve and display collections of historical physics instruments. The DHP has organized numerous sessions at the CAP congresses, on its own or jointly with other divisions. Anniversaries (for instance of the discoveries of superconductivity, the atomic nucleus, cosmic rays or the first Solvay meeting) have often provided session themes, as well as reminiscences of outstanding Canadian physicists or histories of individual physics departments. The session on the history of the laser at the 2010 Congress featured no less than five former CAP presidents as speakers. The breadth of sessions organized over the years can be seen from our web page. DHP maintains contact with its members by publishing a Newsletter twice a year. Division membership has averaged 120 in recent years, with student members making up a large majority. This is encouraging, but we’ve been working on increasing the number of regular members. Any CAP member with an interest in the historical development of its discipline is welcome to join the division. In June 2017, the current DHP executive was put in place: Louis Marchildon (UQTR) chair, Patrick Clancy (McMaster) vice-chair, Jean Barrette (McGill) treasurer and past-chair. Patrick will take over as chair at the 2018 CAP Congress and a new vice-chair will have to be recruited. The Division of Theoretical Physics (DTP) has been active in 2017-2018 organizing its sessions at two conferences: the CAP Congress 2018 and Theory Canada 13, a satellite conference for theoretical physicists to be held at St. Francis Xavier University in Antigonish, NS June 7-9, 2018. DTP, jointly with WITP, also runs the DTP/WITP Ph.D. Thesis prize. There have been many positive and significant developments this year. We received record submissions (six in total) to the DTP/WITP thesis prize. This large number required us to secure a third judge to evaluate the theses. The winner will be announced around March 31, 2018. DTPs choice for plenary speaker, Juan Maldacena, considered to be one of the top theoretical physicists, is a confirmed plenary speaker at CAP Congress 2018. This is very exciting news. 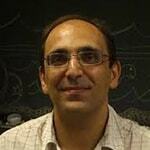 He will be speaking on entangled black holes and traversable wormholes. Theory Canada (TC) is now in its thirteenth year! This is a satellite conference for theoretical physicists held a few days before the CAP Congress. TC 13 received a record number of sponsorships this year (including corporate sponsorships). 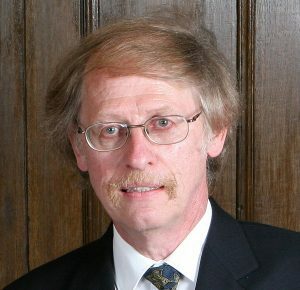 The robust funding is a clear sign that Theory Canada has achieved the full trust of the physics community and is an integral and permanent part of the landscape of Theoretical Physics in Canada. The present DTP executive is composed of an exceptional group of highly dedicated individuals: Mark Walton (Vice Chair), Svetlana Barkanova (past Chair), Hubert de Guise (Treasurer) and the Chair (Ariel Edery). Mark Walton will be the new DTP Chair after CAP Congress 2019. Submit your photograph of a beautiful or unusual physics phenomenon and explain it in less than 200 words for your chance to win the 2018 Art of Physics Competition. The challenge is to capture some of the interesting images that are created by physics and explain the general physics principle behind your submitted photograph. Individual (open and high school) and high school/CEGEP class entries can be submitted from March 15 to April 15, 2018. Visit the Art of Physics page for the entry form and competition rules. All entries must be original artwork produced by the participant. Winning entries will form part of our Art of Physics exhibition which may be requested for display at venues across Canada, and may appear as a cover on our publication, Physics in Canada. They will also be posted on our Art of Physics website. We hope you will take advantage of this opportunity to explore the art of physics by submitting entries for the 2018 competition. The CAP is happy to announce that it will be sending Kate Fenwick of Queen’s University to be the Canadian representative for the International Association of Physics Students delegation that will be volunteering at the May 16, 2018 UNESCO celebration in Paris, France to launch the first Annual International Day of Light (IDL). Kate will have the opportunity to work alongside many physics students from around the world to help celebrate (and explain) the importance of light and light based technologies at that event. Kate is an MSc student with Dr. James Fraser working with light-matter interactions. Not only is Kate deeply invested in her studies, she is also passionate about scientific outreach and is an active member of Robogals North America which promotes inclusivity and diversity in STEM. She was a co-chair of the 2018 CCUWiP conference held at the beginning of January at Queen’s University. Congratulations Kate! We look forward to hearing about your experience when you get back. In the meantime, CAP will be hosting a website dedicated to the Canadian activities and events celebrating the International Day of Light at www.cap.ca/idl. We encourage our members and physics departments across Canada to plan events on or around May 16th to celebrate the International Day of Light. We expect the site to be live in mid-March, wherein we will collate and post information about Canadian events, as well as promote research stories involving optics, photonics, optoelectronics, etc. We are told that the Office of the Minister of Science, Kristy Duncan, is interested in monitoring our site for news about the Canadian IDL events! Look for the announcement of the launch of this website within the next few weeks, and tag your events with #IDLCanada18. For more information, contact the National Node, CAP member, Chitra Rangan from the University of Windsor at dayoflightcanada@gmail.com. Research and community news from our industrial and corporate partners. April 16th, 1968: TRIUMF receives official federal approval and funding. Fast forward 50 years and the lab has grown into a diverse institution serving the international community. With 5 decades of science, discovery, and innovation under our belt, there’s plenty to celebrate during our 50th anniversary year – and we want you to be a part of these celebrations. On April 16th, wish us a happy birthday on social media using the hashtag #TRIUMF50 and by tagging @TRIUMFLab. 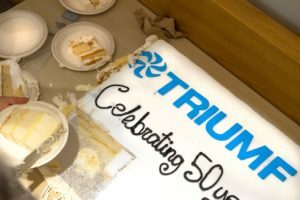 Visit www.triumf50.com for a list of this year’s events and to learn more about the history of Canada’s particle accelerator centre. TRIUMF Science Week 2018 on July 16-19, 2018 will be the major scientific celebration of our 50th anniversary year. The week will include a special alumni event and a 50th Anniversary Science Symposium, in addition to the ARIEL Science Workshop and the TRIUMF User’s Group (TUG) Annual General Meeting. We invite you to join us at TRIUMF for a week of exciting discussion about our science – past, present, and future! Mark your calendars for a week of activities, talks, and panels that look back at the past 50 years of success, and ahead to our bright future. More details about Science Week and registration information will be available soon at www.triumf.ca/science-week-2018. Physicists often need to move samples in a confined vacuum chamber. 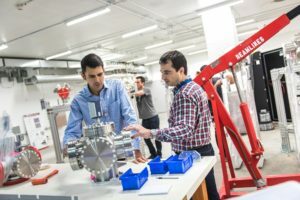 In situations where available space is limited, the UHV Design TETRAXE allows both the X and Y actuation methods to be moved to alternative positions to avoid mechanical clashes if required. Moving the manual hand wheels or motorization kits requires no special tools or training and can be completed on-site by following a simple process. In addition to this feature, the mounting flange incorporates an integrated +/-2 degree tilt for convenience during final alignment. Straddled holes on the fixed flange are offered as standard with In-line clear holes available as an option. 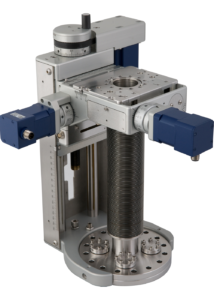 The TETRAXE is available with CF38, CF64 and CF100 mounting flange options and up to 300mm linear travel. In the summer of 2016 Sudbury composer Robert Lemay and poet Thierry Dimanche, both faculty at Laurentian University, made a visit to SNOLAB for an experience that would inspire a body of artwork called Fragments noirs, and become a larger collaborative project by the duo titled, Deux milles mètres sous terre. Lemay composed nine musical commentaries that were inspired by the poetic extracts of Dimanche’s writing after the visit. 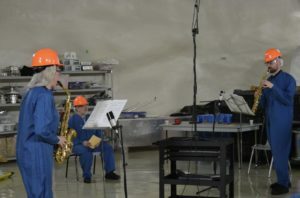 The pieces were scored for two saxaphones and recorded at SNOLAB in the large experimental cavern called the Cryopit, which has remarkable acoustic properties due to its shape and size. The “Fragments noirs” recording is for sale through iTunes, other digital downloading services and from streaming platforms such as Spotify. Lemay and Dimanche will have the debut performance of their work at the Théâtre du Nouvel-Ontario in Sudbury on Saturday March 17th in an event called Sols et sous-sols. March is National Engineering Month in Canada and SNOLAB will be celebrating some of the many engineers whose hard work, expertise and dedication make the science at SNOLAB a reality. Keep an eye on the SNOLAB social media platforms (Twitter, Facebook and Instagram) @SNOLABscience to follow along as we highlight engineers who are working here at SNOLAB.